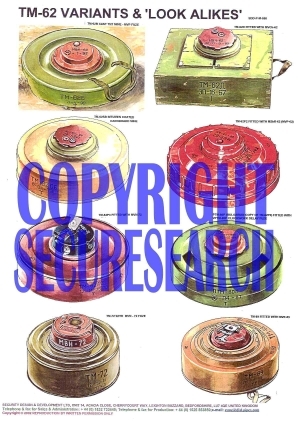 This security poster illustrates TM-62 Variants Anti-Tank Mine and Look Alikes, a number of the variations of the TM-62 family of mines. The security poster also includes visual identification of various fuze options as well as two more modern look alikes. This security poster features the TM-62B cast TNT mine with MVP fuze, TM-62D fitted with MVCh-62, TM-62SB Bitumen coated cardboard mine, TM-62P2 fitted with MShR-62 (MVP-62), TM-62P3 fitted with MVN-72, PTM-80P (Bulgarian Copy of TM-62P3), TM-72 with MVN-72 fuze, and TM-89 fitted with MVE-89. TM-62B cast TNT mine with MVP fuze. TM-62SB Bitumen coated cardboard mine. PTM-80P (Bulgarian Copy of TM-62P3). This security poster features the TM-62B cast TNT mine, TM-62D, TM-62SB Bitumen coated cardboard mine, TM-62P2, TM-62P3, PTM-80P (Bulgarian Copy of TM-62P3), TM-72, and TM-89.